Randy Untweiler, seventeen, a tall, skinny kid with dark blond hair, was the one who found her. He came out of the movie theater by the back door. He’d stayed after the last show to sweep up, and was carrying a bag of trash to be put into the huge green Dumpster near the door. He wouldn’t have seen her, because it was dark and had been snowing heavily—in fact, it was still snowing. All he knew was that he tripped over something big and hard, and fell. The trash bag split open when he landed on it, and he began swearing as he picked up the candy wrappers and empty popcorn and soft drink containers by the glow of a distant streetlamp. But Randy decided that such things as finding dead bodies didn’t happen to people like him and therefore it wasn’t real after all. Maybe it was a store dummy—he pulled off a glove and touched the face and found it as hard and cold as plaster. Still, he phoned his girlfriend, Harriet, to consult with her, and while arguing with her about it, Adam arrived, still zipping up his coat. Adam, short, plump, and intelligent, looked at the body and declared in scatological and obscene terms that Randy must quit acting like a fool, hang up on Harriet, and call the police. There followed a lengthy scene involving a squad car and an ambulance, made surreal by lights flashing blue, red, and orange in the blowing snow. Though the woman was frozen stiff, the responding policeman could not declare her dead, nor could the emergency medical technicians. Nor could the two teens leave. Everyone had to wait for a representative from the Hennepin County Medical Examiner’s Office. The man on duty lived in Maple Plain, a long way off, and he was grumpy on arrival. He prodded the dead women’s rigid face, tried and failed to lift an arm, and sighed at the obviousness of it all. “Take her to the morgue,” he said, and went back home. Randy and Adam were dismissed with a tale they could tell for the rest of their lives—Randy would have nightmares for years about kicking an old dead woman in the head—but the story rated only two short paragraphs in the next morning’s Star Tribune. No one knew who she was. She had no ID in a purse or pocket—no purse at all, in fact, just some old plastic shopping bags full of the detritus of her life. The sad assortment of objects—ranging from a change of underwear to a badly worn stuffed toy kitten to a half-used box of Handi Wipes—had nothing with a name on it. She didn’t match the description of anyone on the missing persons list, so there was no name or age or city of residence to lead to an identification or cause a twinge of sorrow. It appeared to be one of those deaths no one likes to think about, which happen to people living on the fringes of society. Not surprisingly, under her body there had been found an all-but-empty quart bottle of bourbon, which, in most minds, explained it all. Because there had been a spate of killings in an inner-city neighborhood as a gang war heated up, the unknown woman’s autopsy was moved down in order to discover legal medical information about the young male victims. Her body was not subjected to an autopsy for almost a week. Five days after its discovery outside the movie theater in Excelsior, a Social Security card was discovered in the innermost recesses of her clothing, much faded and battered. And that’s when her name was revealed: Carolyn Marie Carlson. At age fifty-three, Carolyn was known to the police as a petty thief, a public drunk, a resister of arrest, a vagrant, a disturber of the peace. She had been thrown out of a number of homeless shelters for stealing, intoxication, and fighting. He shut off the tape recorder he’d used during the autopsy, from which he would compile a report. The body had a number of old bruises, none of them serious enough to contribute to her death, and he’d found nothing else that could be a cause of death. Dr. Halperin suspected it was exposure, complicated by the muddled thinking years of heavy drinking can induce—he’d found all the physical damage prolonged alcoholism can cause. Still, he’d taken blood and tissue samples to be tested. “Now at least there may be next of kin to notify,” he concluded, picking up the Social Security card and rereading the name. Carolyn Carlson. Nice name. He wondered if she had been called Carol, or perhaps Lynn. “What would a dead man be doing with pennies on his eyes?” asked Godwin. They were in Crewel World, Excelsior’s needlework shop. The big front window faced north, and the sun had gone south. Godwin missed the morning sunlight that poured in during the summer, but not terribly; sunlight fades fabrics and paper. Artists are very fond of northern light; it’s best for telling colors. 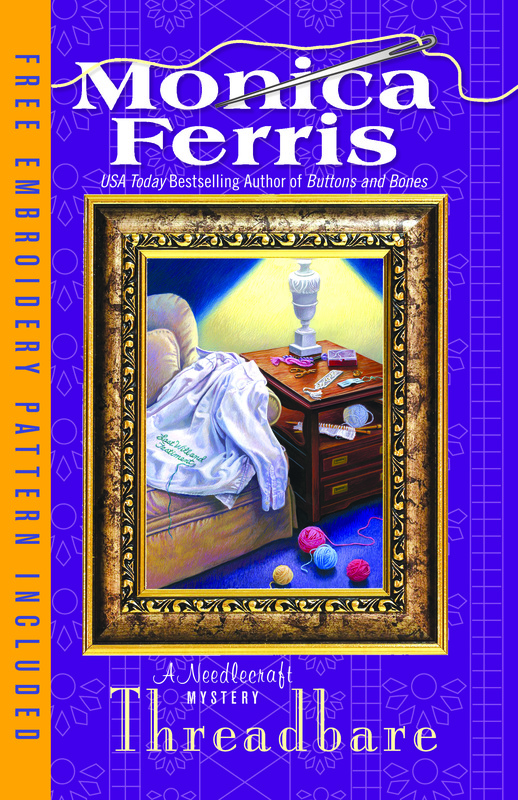 And stitchers are artists in needlepoint, counted cross-stitch, knitting, and related needlework. “Oh, I see.” Godwin stored that tidbit about stealing pennies away in his memory banks—he was peculiarly fond of old-fashioned terms and expressions. “Yes, ma’m, gladly.” Godwin picked up the canvas. It depicted three Scottish terriers standing with their forepaws on a windowsill to look out at a winter scene of snow and naked trees—with a reindeer just coming into view. In the foreground—in the foot of the stocking—were wrapped Christmas presents sitting on a patterned rug. Godwin was a good-looking man a little below medium height, slender, with pale gold hair and light blue eyes. From a distance it was easy to believe he was in his early twenties, though up close the fine lines around his eyes and mouth gave away that he was closer to thirty. Once upon a time this caused him great anxiety, but now that he was in a settled relationship with Rafael (who was thirty-five), it didn’t seem to matter. He was Crewel World’s store manager—or as he put it, Vice President in Charge of Sales, Personnel and Displays, and Editor in Chief of Hasta la Stitches, the needlework shop’s newsletter and web site. He led Margaret over to the far wall, where four long rows of knobbed wooden pegs supported thin skeins of needlepoint wool yarn in colors ranging from white and palest yellow, through deepening greens, reds and purples, and ending in black. Beside it were spinner racks, with DMC perle cotton in every color on one, and the more exotic flosses, including the hairy Wisper and furry alpaca, on the other. He said, “Let’s start at the top. How about Crystal Rays dark blue for the sky?” He lifted a card of the shimmery ribbon from a rack. The sky on the stocking was darker at the top than the bottom, so he then reached for a lighter shade. “Oh, Margaret, that’s so sad! How awful for her family to learn that she died that way!” Godwin, who had a kind heart, had a brief, unsettling image of an old woman stumbling around in a snowstorm, helpless with drink, too fuddled to find her way to shelter, then falling . . . He frowned and blinked the image away. They selected an off-white DMC Perle cotton floss for the antlers, and the same for the square frames of the window. They chose pink, white, and maroon wool for the patterned rug, but the rest—the presents, the wooden floor, the wall—were all to be done in DMC Perles. She needed a set of roll bars for the canvas—“All my others are in use,” she explained, being the sort of stitcher who generally had four or five projects under way at once. Her bill came to nearly five hundred dollars, which she put on her credit card. She thanked Godwin both for his help selecting the fibers and for listening to her distress over her cousin, and left. “Ah. Of course,” said Godwin, nodding. “That makes sense.” So no mystery here; no need for Betsy to exercise her sleuthing skills over this death.